Today marks the 1st day of the A to Z challenge 2016. It’s my first time in the challenge & I am going to learn so many things all together. “Smiles here & smiles there” has gone 1 level up from today. I have made a YouTube channel in which I will share inspirational thoughts & other random yet relevant thoughts & also some of my personal experiences. You can subscribe to the channel @ Darshith Badiyani. For today’s alphabet ‘A’, I had many words to talk about like Amplify, Ascend, Attitude, Accept, Artificial, Aim but I didn’t on any of those. To check out the word on which I share my thoughts is in the below video. I would be grateful to you all if you like, comment, share & subscribe to my new channel so that maximum people can connect to my words. Help spreading the positivity and spreading smiles. That is surely taking your blog to the next level! The first reaction I had for the post is, you are wicked to make us watch the video by adding suspense to the word. And then, a Wow, for making it to your A list of bloggers.. 🙂 Thank you! 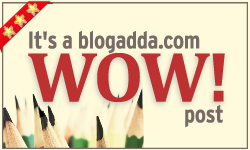 I love the concept of adding fellow bloggers as part of the letter theme.. Good one!! Will be looking forward to the other posts! Good luck! Darshith, I wish you luck in your endeavors. You have a wonderful kindness in your voice. Study what you love to do and work hard and you will succeed. Take time to smell the flowers and enjoy life. I put a list on my cell phone calendar of chores to be done. As I do them, I erase them. If I don’t get them done, I change the date to the next day. Take time to enjoy life.Good job!! Stopping by on the A-Z circuit. I like your idea of including videos as part of your blog 🙂 Good luck with the challenge! Hey Roslyn. Thanks for liking the idea & also commenting. Great to have you here. Good luck! Love you loads ssh. …. keep rocking it !!!!! Absolutely fantastic buddy.. i think all the words you thought were pretty much compelling .. and the word you chose was good too ..
i liked the whole thought process of dividing the long term and bigger goals into tiny chunks and achieving them periodically . even if you achieve 3 out 5 you can still appreciate your efforts . every dreams starts smalls and daily tiny efforts each day would lead you to huge victory .. I totally agree with you, Sup 😉 Thank you having a look at the video and liking my work and appreciating it with your comment 🙂 Have a great sunday! Oh and another thing I want to say is, place the camera at a parallel level to your eyes, okay? Oh and did you see the Amazon link for Dance Dream I sent you? You are always welcome Bhai… And it is OK Bhai. Aaram se.. Kahi nahi jaayega vo Bhai..
Great video, Darshith! Unfortunately, my YouTube app is not working properly and I cannot comment on your video, so I’m going to comment here instead. I would like to give you some constructive criticism. Try to place the camera a little higher or sit on a smaller chair so that the viewer and you are on the same level. That way, the viewer feels more welcome and less intimidated. I’m also going to launch my own channel in a few days, seeing you making one is pretty inspiring for me. I hope I see you later on YouTube. My exams are over! It’s my holidays! Yaaaay! Hahahaha, that’s my gameplan! If somebody goes out anywhere, I’ll just tag along :p, that’ll be my trip. Pretty cool Darshith ! Just a thought, What would you look like if you sat on a shorter chair in your video ? Rock on ! ; ) BTW , Nice English !